How to increase restaurant sales without advertising – Yes this can be done. This article is about how to increase restaurant sales without advertising. The article is accompanied by a video (see below), which demonstrates a small restaurant business. In the video, the example restaurant business has current sales of £125,458. The demonstration shows how this restaurant business increased its sales by £39,285, making a total of £164,743 after the increase. No matter how large or small your restaurant is, increasing your sales without advertising using the strategy demonstrated in the video is very much possible. The sales increase for this example restaurant was achieved without spending a penny on advertising too. There are many strategies to increase sales in a restaurant, but in this article the focus is on the average customer spend or the average transaction value. Whilst focusing on your average customer spend will apply to both existing and new customers, this is one of many strategies that works extremely well when directed to your existing customers. This means you will be able to apply this strategy to your restaurant business to improve your sales, without having to spend money on advertising. By focusing on existing customers, instead of new ones, this will firstly save money on advertising costs. But secondly, this strategy will help you to really focus on providing a meaningful experience for your customers, each time they visit your restaurant. There are many ways you can introduce to increase your average transaction value. For example, asking customers questions about having additional side dishes, combining courses together in price packages works well. The best way to find good ways for this is to engage with your team and to ask your customers. The strategy described in the video is not just for fine dining or other more casual seated restaurants, but can also be used in all types of restaurant. This includes fast food and takeaway restaurants too. The video demonstrates the impact of increasing your average customer spend by a small amount, how this has a dramatic impact on the sales of your restaurant. But more importantly, the profits of your restaurant. It’s not just about focusing on increasing restaurant sales, but it’s also about focusing on your profit margins and the amount of profit that your restaurant business makes too. In the video example, the restaurant has a current average transaction value of £49.50. The sales are shown to increase by £39,285 as a result of increasing the average customer spend to £65. What is also demonstrated in this video, is the impact this increase in restaurant sales had on profits. 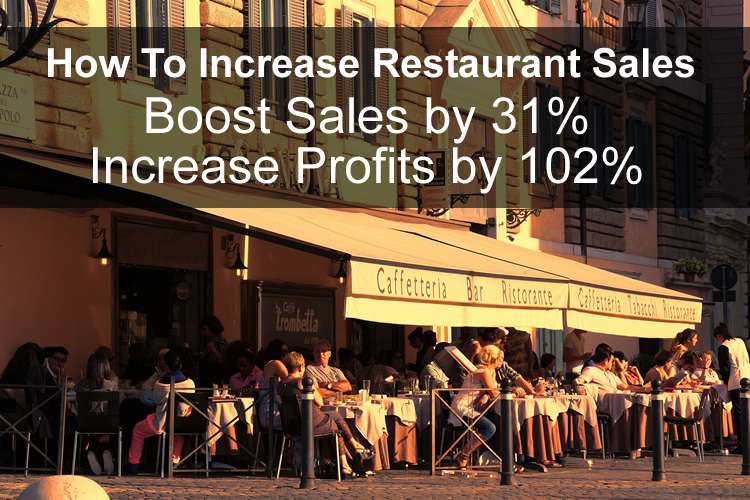 In this example, the restaurant profits increased by 102%. Which is more than double! Profits of the restaurant business went from £23,302 to £47,069. But instead of looking at average customer spend, what about table turnover rates? Many would advocate maximising your ‘Table Turnover Rate,’ which of course is important for most restaurants, but in my opinion this is not always a customer focused strategy. Also, where your restaurant is high end fine dining, then it will be much less about table turnover. So the speed of how fast your tables should turn will depend on the type of restaurant you operate. For example, a more casual style restaurant will more likely want to turn tables faster than fine dining. From a customer’s perspective, whenever I’ve booked a restaurant and I’m told that I can only have the table for X hours, this doesn’t set me up for the best experience. However, when you look at one of the advantages of efficient table turnover rates, when this is used in a customer focused way, this can enhance your restaurant and the customer experience. See further in the article about the advantages of improving table turnover efficiency. It’s important to note; I’m not saying that maximising your restaurant’s table turnover rate is not a good strategy to follow. I would say you need to have this as part of your overall restaurant strategy. What I would say however, is perhaps not to lead with this strategy as your starting point. 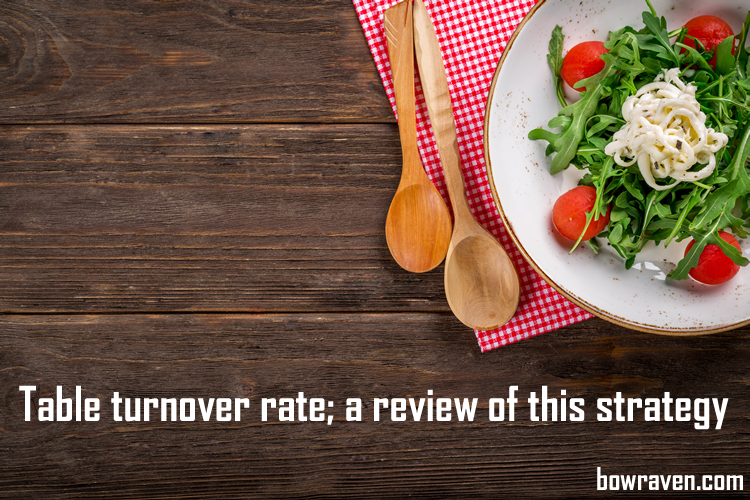 Table turnover rate is one of those difficult balancing acts for any restaurant owner. Also, the type of restaurant you own and the food you serve will affect the turnover rate. Plus the size of the tables and how many in the ‘table party’ will impact on how quickly a table is turned too. So I propose; instead of focusing on table turnover (but see below), focus instead on providing your customers with the best experience possible. With the best food possible. This way your customers will want to spend more time with you. If they spend more time in your restaurant, they are more likely to spend more money on drinks and alcohol, whilst they are with you. Alcohol has a higher profit margin too, so not only will sales increase, but you’ll increase profit margins more with this strategy too. With this approach, customers will want to come back more often, which in itself is a powerful sales increase strategy. That is, how many times your customers return in a 12 month period, will impact your sales. Focusing on this particular strategy will avoid the need for advertising too. Where your restaurant is full with regular customers, firstly means they enjoy your food. But also, you don’t need to spend money on attracting new customers either. Let’s take an example restaurant. For this example, let’s assume the restaurant has 30 tables. The second assumption is that all tables are full and the current average spend is £50 per table. For this example, we are also assuming that the restaurant has the same level of custom on every night they are open, i.e. the restaurant is full. Which is unlikely, but the assumptions are true for both strategies for comparison purposes. If the current table turnover rate for the evening sitting turns over on average two times. Where customers spend on average 90 minutes at the table between 5pm and 10pm. The restaurant opens 6 days per week. The current daily sales for this restaurant are therefore: 30 x £50 x 2 = £3,000. With this example, to increase table turnover from two to three, you are going to have to make your restaurant much more efficient. You are going to have to implement good systems and employ more staff too. What systems and changes you’ll need to implement in order to achieve this increased table turnover? You’ll need to get a waiter/waitress to the table within minutes of your guests sitting down. With larger tables, you’ll need to consider having more than one waiter/waitress to serve the table. You’ll need to stop explaining the menu to returning customers to save time. Unless there are changes to the menu or specials. You will need to get their meals to them very quickly. Which means the kitchen will need to be fast, efficient and staffed properly. And consider dropping the bill off to the table before customers ask for it, to speed up the table turn. The above system improvements, but in particular points one, two and four may require more staff to achieve the improved turn-around. For this example, lets assume this would require three additional team members at an annual cost of say £15,000 each for the waiters/waitresses and the chef at say £25,000. This makes a total cost increase of £55,000 for the three additional team members. The rates you pay will vary from region to region and this is only an estimate of the increase in employee numbers you may need, which of course could be more, but I suggest is unlikely to be less. The annualised increased sales from this strategy is £1,500 x 6 x 52 = £468,000. Assuming a gross profit margin of 60%, the gross profit addition to this restaurant is £280,800 (i.e. £468,000 x 0.60). * This increase ignores any other overhead cost increases, which are likely. For example, energy costs will increase and all costs associated with table turns will increase. There will be more washing up. Example strategy 2 – increase the average customer spend to £65 per table – total sales would then become: 30 x £65 X 2 = £3,900. With this example, to achieve an increase in average customer spend or an increased average transaction value, you will need to look for ways to ‘encourage’ your customers to spend more whilst they are with you. Creating a better atmosphere and allow customers to take their time whilst enjoying their meal with you. By doing so, what’s more likely to happen, is the longer customers are with you, they will spend more on drink. The good thing about drink sales is the margins are higher. Also, with this strategy, it’s unlikely that you’ll need to employ more staff. This means the gross profit margin of the additional sales goes straight to the bottom line. For this example, I’m going to assume that the increased sales accounts for a higher gross profit margin of 75% too, as I’m assuming this includes more drinks sales. The annualised profit increase for this strategy is therefore £900 x 6 x 52 x 75% = £210,600. As you will see improving table turnover rate increases sales and profits more than it does by increasing the average customer spend. The difference is an additional profit of £15,200 (i.e. £225,800 – £210,600). However, if in the ‘table turnover‘ example, another waiter/waitress is needed to achieve the added efficiency of turning tables by three times every night, then the two examples are of equal merit. I know which restaurant that I’d like to operate, but you need to make your own decision. What I’d suggest is to combine both these strategies. However, I’d advocate keeping in mind the customer experience at all times. What are the advantages and disadvantages for each of these strategies? What are the advantages and disadvantages of increasing table turnover? The obvious advantage of increasing your table turnover is increased sales and improved profits. From the earlier discussion about focusing on table turnover from a customer perspective, another advantage of focusing on optimising table turnover, is to reduce waiting times for customers. “Long waiting times in restaurants can be a major source of customer dissatisfaction.” Journal of Foodservice Business Research. Therefore, using this as one of your strategies to increase your restaurant sales, but with a customer focused viewpoint is very much a good thing. The disadvantage of this strategy is the stress it can cause. The restaurant you run will become more frantic. There will be less margin for error, where if things go wrong, they are likely to have a bigger impact. With this strategy, you will need to have higher staffing levels. This in turn could lead to a higher staff turnover rate and additional costs associated with this side of the business. For example, more employee advert costs and time to interview new people. What are the advantages and disadvantages of increasing average customer spend or average transaction value? The advantage of using this strategy is the relative low cost of implementation. For example, implementing a system where waiters and waitresses are trained to ask whether customers want extra sides, making sure customers are topped up with wine on a regular basis and ask if they want more wine, etc. does not cost anything to implement. The main benefit of this strategy of increasing restaurant sales, is that relatively small increases in the average transaction value, will have a major impact on total restaurant sales. The other benefit of this strategy is that one of the main drivers is customer focus. Particularly if you incorporate a customer focus group. Using a customer advisory board to have a group of your customers together, in order to discuss how to improve your restaurant’s food and service, can pay huge dividends. This can also lead to increases in average customer spend. For example, for one of my businesses, the customer focus group suggested that I should increase my prices. This resulted in an immediate profit increase. I couldn’t think of any disadvantages for this strategy. Unless you regard the time needed to spend with your team to discuss ways to increase your average transaction value as a disadvantage. I don’t see it that way, in fact I see this as fun. It’s great to get the creative juices flowing. Why, of all the strategies to increase sales in a restaurant, use average customer spend? 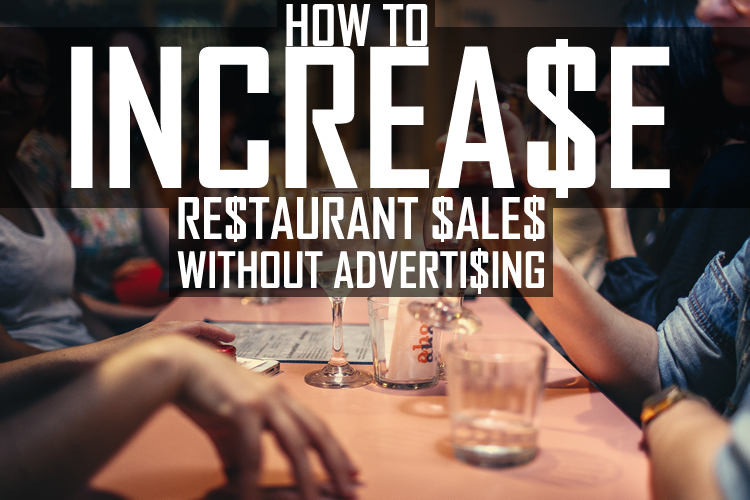 Increasing restaurant sales without adverting may seem impossible, but in addition to reading this article, please also watch the above video. By doing so, you’ll discover the true power of both working with your existing clientele, and the power of focusing on what I regard as one of the most powerful key profit drivers. Of all the strategies to increase sales in restaurant, this one is my favourite. The strategy involves working with your existing customers, rather than using advertising to gain new customers, and it can be a whole lot of fun too. Focusing on your average customer spend is not the only way to increase restaurant sales without advertising, but this is the method described in accompanying video. Before you can focus on your average customer spend, and on ways to improve the amount spent, you will need to know how to calculate this first. To calculate your average customer spend, you begin by looking at total restaurant sales over a given period. This period can be a day, a week, a month or 12 months. In the example shown in the video, a 12 month period is taken. To arrive at your average customer spend, you need to divide this sales amount by the number of transactions over the same period. For this purpose a transaction is represented by a customer visit to eat and/or drink at your restaurant. It’s important to include a customer’s total spend for a single transaction. So for example, if a customer spends at the bar, before sitting at the table to eat, then this income should be combined with the table sales too. Of course, I need to add a disclaimer here. Not all businesses are the same. This is an example restaurant business. It’s a demonstration of what could be earned as a result of implementing this strategy. But combined with using our Increase Profit Software. As with any business, your results may vary. Results will be based upon your individual capacity, business experience, expertise, and level of desire. For more information on our disclaimer in this regard, please visit our website terms. Thank you for taking the time to read this article on how to increase restaurant sales without advertising. If you’ve enjoyed reading the article, please share it on your favourite social media network below. Alternatively, or additionally, please leave a comment below too. Also, if you have any questions about how to increase restaurant sales without advertising, please ask these questions by commenting below.